Boy, have things been busy around here! I just wish it was because I'd been spending time sewing. But alas (now how often do you get to use that word!) it has more to do with preparing for the holiday than with sewing. But I've made some progress. As you can see below, I finished up 5 more houses for my "Have Yourself a Quilty Little Christmas" quilt. You can pretty much see which stage I'm in. I've finished assembling the individual units and am in the middle of pressing them. All I have left is joining them together (like in my test block, bottom left). And may I just say how totally cool it is to be using scraps from Bandana by Me and My Sisters Designs when it hasn't even been released yet? I won a jelly roll of LOL from them and they padded the shipping box with the scraps. They were perfect for this quilt so they made their way in. I'm so in love with this quilt so far! I CANNOT wait to see how it all comes together. I have this sinking feeling Cassidy will want to claim it, but nope, this one will be mine! That's it for today. 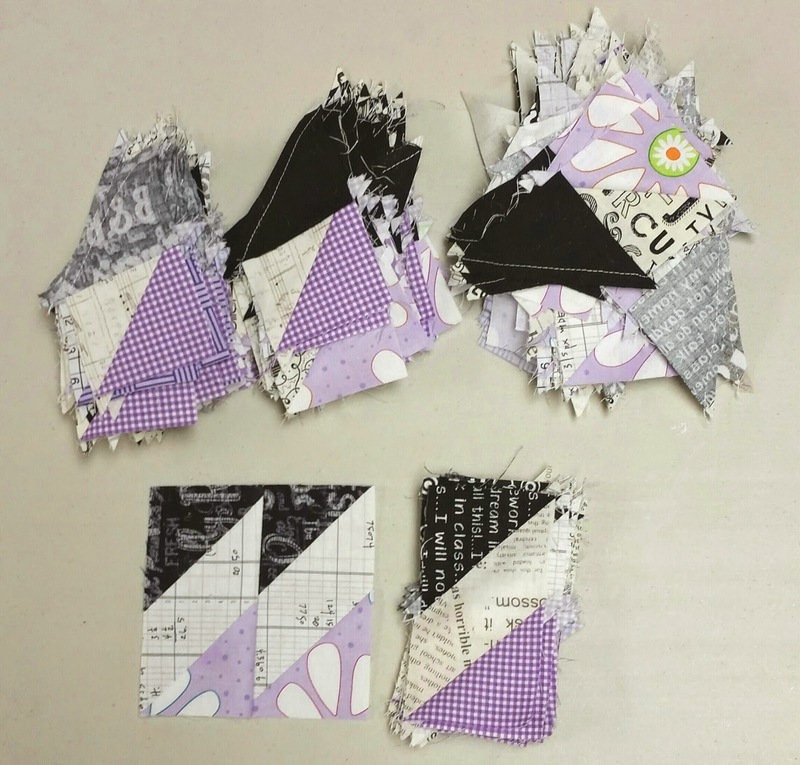 Come see what everyone else is working on over on Design Wall Monday with Judy at Patchwork Times. 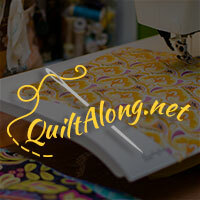 And see how far everyone is getting on their mystery with Bonnie over at Quiltville. Your Quilty Little Christmas quilt is looking absolutely gorgeous! Love the colours in the Grand Illusion blocks. I love your colors! I'm using purple in place of the pink too, and I'm really liking the purple with the black. And how lucky are you to be using fabric that isn't even released yet. How did you get to be so lucky? LOL! Now to get your units sewn together, that part goes quickly. You can do it! Your colors are great! Hope you keep posting as I like to see the different colors folks are using. Love your quilt. Also really like your colors for Grand Illusion, such fun to see what others are doing. I wish my excuse was that I am getting ready for the holidays. Instead it is wrestling. It just started so here goes the beginning of two day wrestling weekends from now until February. I love watching my son and I enjoy doing hand work while I set through the other matches. Your design wall is fantastic. I still have yet to begin "Grand Illusion". I have selected fabrics and now just need to get a move on it. Once I get this horse quilt quilted I can. What a wonderful design wall. I see some things I'm working on, too! I love your purple! I almost incorporated purple in my color scheme, but ended up with orange instead...didn't think of lavender...(sigh)ohhhhh well! I love your colours for the Grand Illusion quilt. The holiday prep does put a bit of a squeeze on my stitching time too, it's quite a bummer. 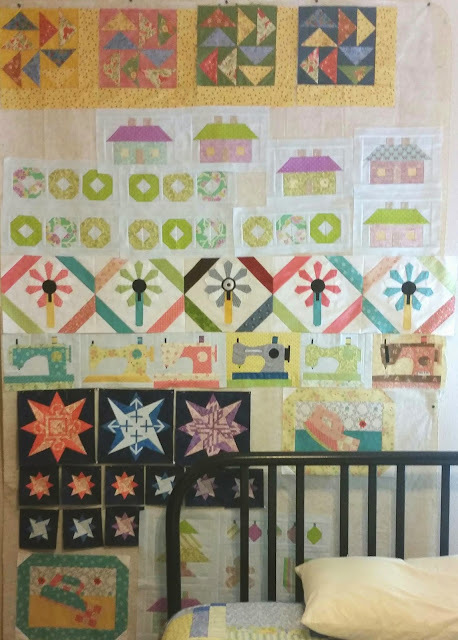 You have some fun blocks up on the design wall, the sewing machine blocks are especially cute. Love the purple you are using in Grand Illusion. Lots going on with your design wall. Yes, I hear you -- You do need a bigger wall. Maybe two?? Love the colors of your Grand Illusion.